We have to end Ruffle Week 2011 with a bang…I believe that is cake is the cake to do just that. In case you have no idea what I am talking about, ombre is basically taking the same shades of one color and having the colors scale from light to dark. We’ve talked about it a time or two here. I have seen this done on everything from dressers where they bottoms drawers are dark and they progressively get lighter as they go up, to hair. Yes. You can ombre your hair. 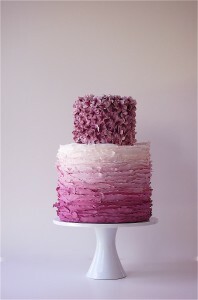 This cake takes a dark purple base and goes up to a very light lilac and adds ruffles to give it a little extra flair. In other words…it rocks my stinkin’ face off. The dark tier on the top has dark purple flowers that are simply gorgeous. What do you think? Are you an ombre fan? Did you love Ruffle Week 2011? Should we repeat it in 2012 or do you think ruffles will be totally gross by then?